Entec Sound & Light began life in 1968. Like most profound stories, however, this one has an interesting prequel… one that pre-dates the rise of rock’n’roll and takes in some of the biggest moments in 20th century popular music. Jazz aficionado Harold Pendleton quits his accountant job and moves to London, later becoming the secretary of the National Federation of Jazz Organisations of Great Britain. Later simplified as the National Jazz Federation (NJF), it had been founded by a committee of musicians, journalists and club owners who wished to regulate the quality of London’s jazz scene. Pendleton also becomes the drummer and, subsequently, the manager of Chris Barber’s traditional jazz band, as well as bringing to the UK many American artists like Muddy Waters and Howlin’ Wolf to perform with the band. With banjo player Lonnie Donegan in the line-up, Barber’s band also helps to trigger the skiffle craze. Together, they record the huge Transatlantic hit Rock Island Line in 1954. Inspired by the Newport Jazz Festival in the US, Lord Edward Montegu asks Pendleton to organise the UK’s first open-air jazz festival at his estate in Beaulieu, Hampshire. Despite stating he preferred to work in roofed locations (not least due to the British weather), Pendleton takes on the challenge. Although the first festival is a success, Pendleton parts ways with Montegu over its future direction. The festival lasts another five years and attracts significant coverage on BBC television. This, however, helps to cause and then amplify the widespread media storm around the so-called ‘Battle of Beaulieu’ riots in 1960. Consequently, Pendleton is asked to return to manage the festival in 1961 which – given the rise of further crowd incidents – he wisely declines. As the NJF’s secretary, Pendleton is now promoting around 200 concerts a year, including legendary shows at the Royal Festival Hall and trips abroad, such as an excursion to Paris where a party of NJF members watch Louis Armstrong perform. 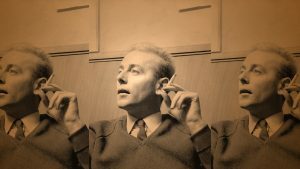 Lacking a regular venue for NJF concerts, Pendleton seizes the opportunity to host jazz nights in the basement of the Academy Cinema at 165 Oxford Street, London W1. Often cited as the most important European venue in the history of modern music, the Marquee Club is born here on April 19th 1958 with the first ‘Jazz at the Marquee’ event. It is the first of many steps towards changing the face of British live music. Fired up by the success of the first Beaulieu Jazz Festival and armed with a strong desire to not only restore the reputation of jazz after the Beaulieu riots but also demonstrate how a festival should be run, Pendleton’s quest to create his own event on a suitable site finally ends. Against the odds, he persuades the owners of the Richmond Athletic Association to allow him to hold the UK’s first National Jazz Festival (NJF) on its grounds on August 26-27, with wife Barbara looking after administration. The NJF brings new talent to bigger audiences and plays a crucial role in the support and development of jazz, blues, R&B and – later – rock music in the UK, as well as introducing festival culture to the masses. Continuing today at Reading and Leeds, the festival will continue to showcase a range of genres for more than half a century, launching what will become Entec in 1968 and the festival’s Reading home in 1971. Brian Jones advertises in Jazz News to find band members for his new R&B band. Later, a Marquee cancellation by Alexis Korner’s Blues Incorporated presents the opportunity for new band to make its live début. When on the phone again to Jazz News to confirm this first gig – on July 12 – Jones was asked for the band’s name. He saw a Muddy Waters album lying on his floor and one of its tracks was ‘Rollin’ Stone’. On the spur of the moment, The Rollin’ Stones are born. 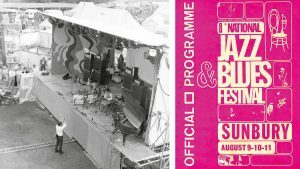 Featured within an otherwise mostly traditional bill of acts including Acker Bilk, Humphrey Lyttleton, Chris Barber and the Tubby Hayes Quintet, The Rolling Stones’ appearance at the third National Jazz Festival marks the first significant move away from a ‘purist’ jazz approach. The Stones emerge victorious and are booked as one of the headliners the following year. On March 13th, the Marquee Club relocates to 90 Wardour Street, London W1. The opening night stars Sonny Boy Williamson, Long John Baldry with the Hoochie Coochie Men (featuring Rod Stewart) and The Yardbirds who, with Eric Clapton, record their LP début Five Live Yardbirds that same night. 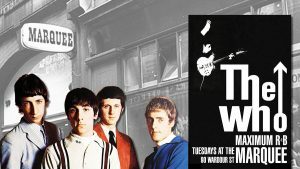 It is also here that The Who begin their influential Tuesday night ‘Maximum R&B’ residency. The fourth National Jazz & Blues Festival is broadcast on BBC1. Already the owner of the successful booking agency Marquee Artists and music publication Jazz News, the Marquee Group of Companies opens Marquee Studios at the rear of the club in October. The Moody Blues’ No.1 hit ‘Go Now’ is recorded at the studio’s first session booking before building work is complete. Reflecting the diversity of its artists, the National Jazz Festival becomes the National Jazz & Blues Festival. Highlights from the three-day August event are broadcast on the American music show ‘Shindig’. The sixth National Jazz & Blues Festival, held at the new location of Royal Windsor Racecourse, will be referred to in time as the UK’s first rock festival. Renowned for the first major UK performance by supergroup Cream – billed as Eric Clapton, Jack Bruce and Ginger Baker – the stellar line-up also features headliners The Who, Small Faces, The Yardbirds and the Spencer Davis Group, as jazz and blues take a back seat. The Marquee tent bill includes a new Fontana Records signing – Bluesology – whose pianist is Reg Dwight, the man who will soon be known as Elton John. 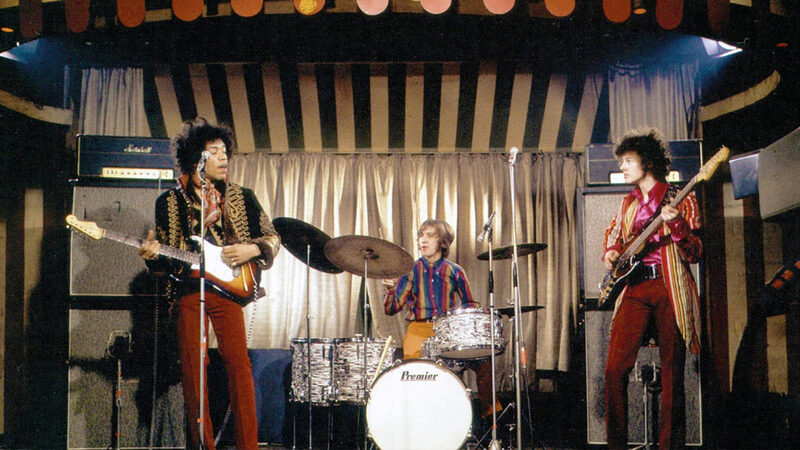 In January, a new attendance record is set when Jimi Hendrix plays his first Marquee show in the wake of the Experience’s first single, ‘Hey Joe’. Hendrix returns with The Who, Geno Washington, The Smoke and Cliff Bennett’s Rebel Rousers when German music show ‘Beat Club’ films a pair of episodes at the Marquee in March. 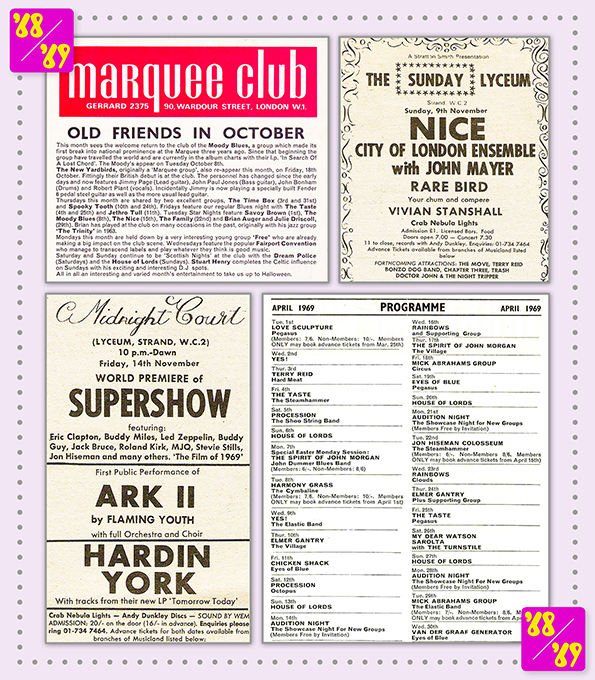 Before the end of the Sixties, Marquee audiences also witness definitive early performances by David Bowie, Led Zeppelin, John Mayall’s Bluesbreakers, The Pink Floyd, Manfred Mann, Yes, King Crimson, The Animals, Peter Green’s Fleetwood Mac, The Nice, Soft Machine, Jethro Tull, The Move and the Spencer Davis Group featuring Steve Winwood, among many others. At the Royal Windsor Racecourse for the second year, the National Jazz & Blues Festival has a new, ground-breaking stage designed by Keith Albarn, the father of Blur frontman (and future Entec client) Damon Albarn. It sets a new industry standard, as does Charlie Watkins’ new WEM 1kW PA system, the world’s first high clarity, high power system, which makes its début at the festival. Pat Chapman’s light show, Crab Nebula – named after an exploding star – is at the forefront of the psychedelic movement. Chapman approaches Pendleton, offering his lighting services for the National Jazz & Blues Festival at Kempton Park Racecourse in Sunbury. A partnership is founded as the company is given a base at the Marquee, while providing lighting for the club. The psychedelic element of the light show is achieved with a bank of Aldis and Kodak projectors, thousands of 35mm slides and reels of 16mm film and variable-speed colour wheels, all integrated with custom-made console that could control up to 20 spots in varied positions. The partnership is formalised as Entertainment Technicians Limited, trading under the shorter name of Entec, and extended warehouse space is later found in Wembley. Jobs include lighting Oxford and Cambridge University May Balls where the live acts include The Pink Floyd. Still without a permanent home, the ninth National Jazz & Blues Festival is held at Plumpton Racecourse for the first of two consecutive years. An initial six-month contract to exclusively provide services to ‘Top Of The Pops’ sees Entec introduce its Crab Nebula psychedelic lighting effects as BBC1 goes colour. Entec also provided services at the Lyceum Ballroom for the Friday ‘Midnight Court’ sessions on Fridays ‘Sundays At The Lyceum’, featuring acts ranging from Yes, The Nice, Curved Air and Family to Procol Harum, Caravan, The Pretty Things and Tyrannosaurus Rex.